International Journal of Research in Health Sciences,2015,3,4,487-489. 1,2-Assistant Professor 3,4-Senior Resident, Department of Radiodiagnosis, Indira Gandhi Institute Of Medical Sciences, Sheikhpura, Patna ,Bihar, INDIA. Intrahepatic cholestasis during pregnancy is associated with several adverse foetal outcomes including meconium staining of the amniotic fluid (16-58%)1 ,CTG abnormalities, RDS, preterm labour (36%)2 and sudden intrauterine death(15%)3 . The risk of adverse foetal outcome is thought to be related with the maternal serum bile acid level and a recent study has shown that there is a 1%-2% increased risk for every μmol/l bile acid above 40 μmol/l4. Non invasive monitoring of foetus is a challenge in such cases . 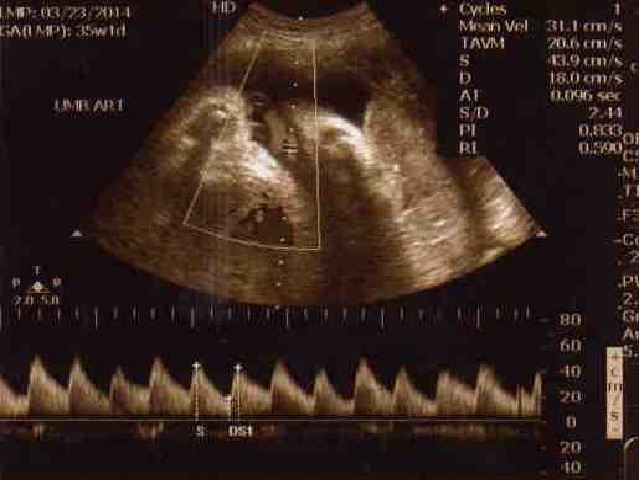 In our case biophysical profile, CTG and umbilical artery flow were normal. Foetal MCA show low impedance flow (increased diastolic flow and reduced RI and PI index suggestive of foetal hypoxia. Large number of case studies needed in such cases to establish association of meconium staining of amniotic fluid and foetal hypoxia with MCA low impedance flow and MCA Doppler study as non invasive diagnostic tool in monitoring of complicated pregnancy with intrahepatic cholestatic pregnancy and reducing the perinatal mortality and sudden intrauterine death.